A couple of years ago, Kenneth Copeland made a distinguished list – not the Lamb’s Book of Life, the final 12 on American Idol or even a follower on my Twitter account. No, after decades of proclaiming faith in that noted southern drawl, he bellowed his way on Sen. Charles Grassley’s list of reprobate televangelists. Since then, Copeland has nothing but flaunt the hand of God while giving the U.S. Senate’s ranking Republican on the Finance Committee probing into his surreptitious pocketbook the finger. A pentecostal one, nonetheless. And now, we have this… he is even stealing from the lost and those who were ravaged by Hurricanes Katrina and Rita. Classy. The book details the 2005 relief efforts made by Kenneth Copeland Ministries (KCM) in the aftermaths of Hurricanes Katrina and Rita, and Copeland’s promises to form a new ongoing aviation humanitarian-relief ministry also called Angel Flight 44 (AF44). However, Rev. Vermillion now says that the aviation ministry was never formed as Copeland pledged: “It is as if Kenneth Copeland had NEVER said such a ministry had ALREADY been formed, nor had repeatedly promised that such an aviation support ministry would be further developed and ready for disasters–such as that which just occurred in Haiti a few days ago. The release and book discusses Copeland’s oath to raise “several million dollars to build an airplane hangar and buy helicopters, airplanes, food and supplies for Angel Flight 44.” Only one small issue – he never did it. You think the money came in? Sure it did. Ask Rick Warren how that goes when you pull a lever and look for your congregation to run to the polls. A better question is you think Copeland gave the truckloads of cash back that was backed up to his hilltop compound? Um, not so much. I’m quite certain the victims of natural disasters everywhere would like a word with you, little man. Namely considering what the Church – not Pat Robertson’s mousey house is doing – but God’s people are doing for the Haitians. Home of Santeria, Voodoo and all sorts of diabolical mischief or not, these are people with nothing, children with nowhere to go and families with no food. Yet, here’s Kenneth Copeland flying the friendly skies and cushioning his seat with cash. Your cash. And we wonder why instead of fellow brothers and sisters lining along the Wall proclaiming the truth of Christ, we have the lost, the hurting and the bitter hurling Molotov Cocktails at these bricks. This mess makes us look terrible, but if “God’s chosen ministers” are full of more crap than a Christmas turkey, who’s to say us Jesus minions aren’t as well?! MEMO to COPELAND: When the old spiritual sings, “I’ll fly away,” it wasn’t talking …because of guilt or shame. Evidently, you have both while swirling in the clouds. At least you should. I noticed boydmiller’s comment, so let me clarify that I have stated elsewhere quite emphatically that I consider several aspects of Copeland’s teaching to be bona fide heresy. 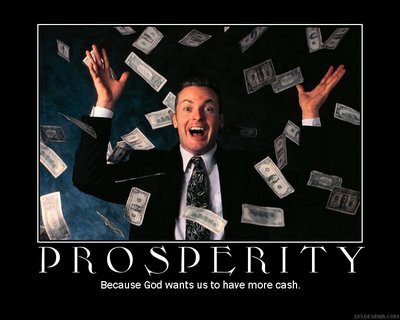 My post, “How I Know and Why I Rebuked Kenneth Copeland” on my own RichVermillion.com blog touches on that in brief, and the post “Prosperity vs. Theological Error” in more detail. That said, “original” WOF theology, when placed within its proper context with other necessary doctrines of theology, is perfectly biblical and very useful for believers. One problem has that few people even know what “original” WOF theology consists of because it has been so grossly distorted by Copeland and others into a mere “get rich quick” scheme, not unlike Bernie Madoff’s (as already noted by others). Another is the fact that even “original” WOF theology was often isolated from the other necessary doctrines and taught almost exclusively by many teachers, giving the “sheep” very distorted views of its proper role within Christian orthodoxy. Thus, error to the left, error to the right. So in short, I AGREE with your assessment of the dangerous errors of today’s highly-distorted “prosperity” teaching and the heretical and bizarre doctrines of many of its proponents. There are a few comments to this effect scattered around KennethCopelandBlog.com as well, but its main focus right now is hitting on the highly documented lies and probable frauds that it covers. Our reason for this is to highlight at this time the immorality and unethical practices of that “ministry” for now, but you will notice on the Table of Contents page that I have “To Be Announced” sections that I am fully able and prepared to populate with topics such as you have addressed herein whenever the time seems appropriate for me to do so (i.e. I have other ministry projects that demand my time as well). I hope my clarifying comments are helpful. Many thanks to hiscrivener for posting this article for discussion. Let me add, by the way, that though we have attempted to strike a more redemptive tone on KennethCopelandBlog.com than what is reflected here in this discussion, we do NOT blame anyone herein for having a somewhat more negative tone about these issues, given the serious nature of the subjects being discussed. I agree with Bene D and if I might add, it seems that Mr. Vermillion isn’t bothered with the criminal enterprise known as WOF or the Prosperty Gospel but has an axe to grind on this one issue. How noble of him! This would be like Bernie Madoff’s assistant starting a blog accusing him of shop lifting at the local Wal-Mart. BAHAHAHAHAHA! It’s ignominious to be all right with one aspect of perversion but hate on others for different aspects of it. I get that. Perhaps, he’ll understand what is the root of this fraud and realize that we are CALLED sheep. We are not sheep, literally. These are real people getting hosed. God be with our dear brothers and sisters. I explain the goals and agenda of my family and I with regard to the KennethCopelandBlog.com redemptive project on the “About” page first and foremost, but additionally within AF44 Section Introduction, AF44 Executive Summary (Synopsis), and the FAQ page. Of course, additional thoughts are scattered within the other articles as well. No, I am not looking for a job. Nor are we really trying to expose the Copelands per se since this has actually been a THREE year effort to get them to address these issues (much of which was attempted privately initially…see the first two FAQs). I realize that the shear size and depth of the website can be overwhelming, but those willing to venture into all its posts will be able to see that our manifest efforts reflect the agenda stated within the header graphic at the top of every page: “We are calling on the man, his family, and his ministry…to simply repent.” Nothing more. Any way, I hope my two clarifying comment posts are helpful. Thank you all for discussing these issues. Blessings again to one and all. I have to say, this post was well-worth tracking back from my stats page to find. I enjoyed your prose, though it is a bit more negative than my own on KennethCopelandBlog.com. You are a true “wordsmith” nonetheless. To answer your question, and Bene D’s about the book: I (and the publisher) took ALL editions off the market after we realized that Copeland and KCM were not going to perform as promised. That occurred in the Spring of 2008. I explain this somewhat under the post, Angel Flight 44, The Book, but given how much is on that website I cannot fault anybody from missing that point. Thus, I cannot properly “pimp” a book that is already off the market, can I? I may be a bit guilty of speaking highly of one of my own written works (but then again, it did actually win an award). So fault me for esteeming the book itself, but please do not think I was trying to promote sales because new editions are now non-existent. Thanks everyone for a very enjoyable post and commentary discussion. Blessings to one and all. I got a few giggles until you started talking of the hurting, in spite of what they may do. I got a feeling that this fine gentleman better enjoy every moment left of his life. Tragic, somehow the story of The Rich Man & Lazarus comes to mind!?! When I saw Rich Vermillion I thought your wit was surfacing. Rich opaque burnt red colour. Ouch. His parents had a sense of humour. I read some of his website, can’t tell if he is pimping his book, looking for work, exposing the Copelands, or all the the above. I wasn’t aware the Grassley investigation was still on-going. Priests on the Internet. Don’t call NBC… yet.